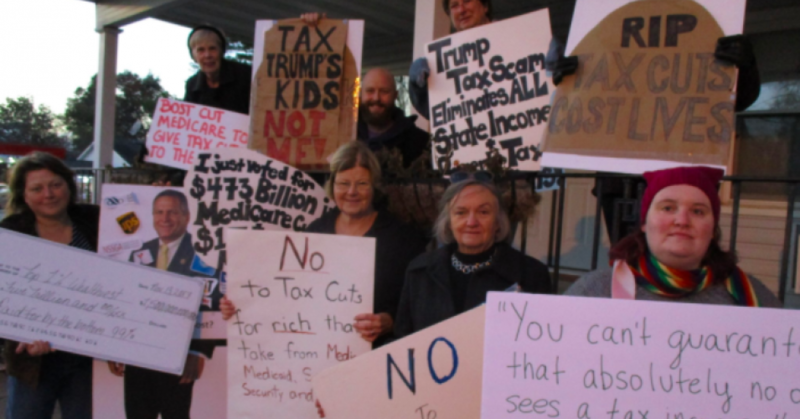 The grassroots resistance group Indivisible was gearing up on Friday for a planned National Day of Action, targeting Republican senators who are thought to be potential “no” votes on the GOP’s tax plan—in a final push to keep the bill from passing. The Senate is expected to vote on the plan as soon as Thursday. The group was preparing for #TrumpTaxScam Sit-Ins taking place across the country on Monday, at the offices of several senators including Arizona’s John McCain and Jeff Flake, Sens. Lisa Murkowski (R-Alaska), and Susan Collins (R-Maine)—focusing attention on some of the lawmakers who were targeted last summer during the fight against the Republican healthcare plan. “Republicans have made it crystal clear: the Trump Tax Scam fight and the TrumpCare fight are one and the same,” the group wrote on its website, noting the Senate Finance Committee’s plan to repeal the Affordable Care Act’s individual mandate, which was revealed earlier this month. The move would leave 13 million Americans uninsured according to the Congressional Budget Office—in the interest of reducing the federal deficit that would be caused by the Republican plan to lower taxes for corporations and the wealthiest Americans. Members of the Trump resistance are expected to assemble at the offices of so-called “moderate” Republicans to demand that the elected officials listen to their concerns about the tax bill, which groups including Americans for Tax Fairness and the Tax Policy Center say would eventually raise taxes for middle-income Americans, after giving them temporary, meager tax cuts. Americans for Tax Fairness released a study on Tuesday showing that 82 million middle-class households would pay more in taxes in 2027, should the GOP plan become law. The Tax Policy Center’s analysis came to the same conclusion this week, while finding that the plan would only produce $169 billion in additional revenue over the next decade, while adding a $1.5 trillion deficit. As of Friday, at least 50 events were planned as part of Indivisible’s National Day of Action. This entry was posted in Civil Rights, Corporate Personhood, Corruption, Demonstrations & Protests, Economics, Government, Health Care, Income Inequality, Peaceful resistance, Social Justice, Solidarity, Women's Issues, Workers' Issues and tagged #TrumpTaxScam, ACA, Atrocities, Capitalism, Civil Rights, Corruption, Economics, Health Care, Income Inequality, individual mandate, Jeff Flake, John McCain, Lisa Murkowski, Protests, social justice, Solidarity, Susan Collins, Trumpcare, Women's Issues, workers' issues on November 25, 2017 by ew.